Discovered this old image of Stonehenge in my archive and had to share it with you. I also managed to find this very old article about saving Stonehenge. This is the text of the historic appeal launched by the Stonehenge Protection Committee and the National Trust in the 1920s to save Stonehenge. Please note that this is not an ongoing appeal. The Stonehenge Alliance will be very pleased to hear from you if you’d like to make a donation towards their current campaign to protect the monument. Click here for more details. Note: We have added the bold emphasis to draw attention to inconsistencies between the National Trust’s highly commendable attitude 80 years ago and the British government’s determination to bulldoze a road through the World Heritage Site today. We have added the strike through emphasis to stop people accidentally donating money by mistake. OVER £14,000 has been raised in three months for the Protection of Stonehenge. More is urgently needed. A Stonehenge Protection Committee has been formed, the object of which is indicated by its title. We desire earnestly to support its appeal to the public for funds. It is now nine years since Sir Cecil Chubb made the nation the magnificent present of the Stonehenge circle itself; and the great stones are safely in the charge of the Commissioners of Works. The land of the Plain around them, however, is still private property. So long as it remains in private hands, there is an obvious danger that the setting of Stonehenge may be ruined and the stones dwarfed by the erection of unsightly buildings on the Plain. Any visitor to Stonehenge may at this moment form a notion as to what, if steps are not at once taken, may happen to the Stonehenge section of the Plain. During the war the military authorities found it necessary to erect an aerodrome and rows of huts very near the circle. These have reverted to the owner of the land, but they are still standing. In recent months an enterprising restaurateur has built a bungalow, the Stonehenge Cafe, within hail of the stones, though happily just out of sight of them. The conditions of modern transport make it extremely likely that this structure, if no preven- tive measures be adopted, will be the first of many, and that the monoliths will in time be surrounded by all the accessories of a popular holiday resort. The Stonehenge ring, as every British child has learnt to picture it from his earliest years, will no longer exist. The solitude of Stonehenge should be restored, and precautions taken to ensure that our posterity will see it against the sky in the lonely majesty before which our ancestors have stood in awe throughout all our recorded history. 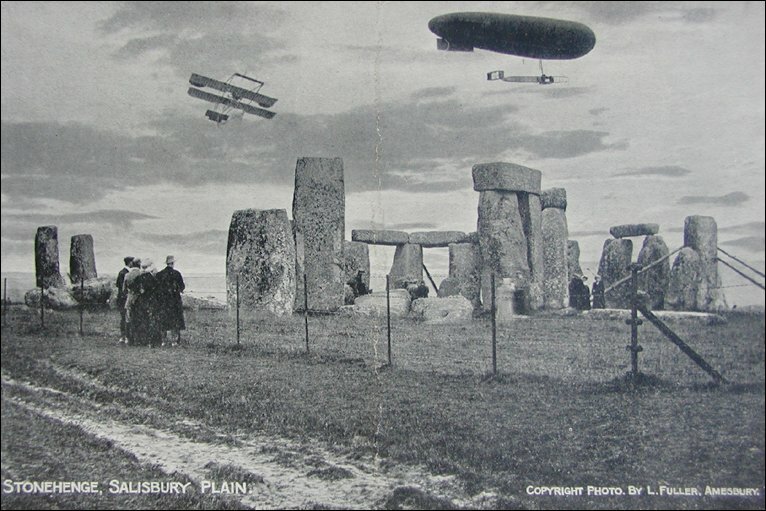 We are glad to be able to state that options have just been secured for the purchase of an area of the Plain which includes the whole of what may be called “the Stonehenge sky-line.” Should the purchases be effected, the Air Force buildings will be removed, further building will be prevented, and the valuable archeological remains of the site permanently protected from the plough. The land purchased will be placed under the guardianship of the National Trust; and part at least of the revenues derived from rents for grazing, etc., will it is hoped, be available for the further protection of the archaeological treasures and amenities of Salisbury Plain. The total area under consideration is 1,444 acres; the sum aimed at is about £35,000. The sum is small compared with several amounts recently raised for the preservation of great national monuments; and here we have a monument unique in its fame and significance. A substantial beginning has already been made; and a first sub- scription. list is appended to this letter. The need is urgent. Projects are already in existence which would involve extensive building and the laying of water mains; and one important option to purchase expires at the end of August. Cheques should be made out to the National Trust (Stonehenge Fund), and crossed Barclayï¿½s Bank, and sent to the Secretary, 7 Buckingham Palace Gardens, S.W.1. As a result of this appeal, and the enthusiastic labour of a Committee including representatives of the National Trust, the Wiltshire Archaeological Society, the Society of Antiquaries, acting with the cordial approval of the Office of Works, half the area in question is already secure. The position may be briefly explained. Short options were, in August, secured by the Committee on three plots which include areas Of 389 acres, 404 acres, and 650 acres respectively. This plot is that to the south and south-east of the stones, which has for years been defaced by the derelict aerodromes and hutments. The cost of this was £8,000. The money was secured before the end of October. PLOT A IS SECURE IN THE NATIONAL POSSESSION FOR EVER, AND THE DEMOLITION OF THE BUILDINGS HAS ALREADY BEGUN. This part of the Stonehenge area lies towards Amesbury, and the threat of building from that quarter is serious. The purchase price is £8,ooo. OWING TO A NOBLE DONATION OF £5,000 BY AN ANONYMOUS LADY WHO HAD ALREADY SUBSCRIBED £1,000, AND A TIMELY GIFT OF £500 FROM THE GOLDSMITHSï¿½ COMPANY, THE PURCHASE OF THIS PLOT HAS ALSO BEEN COMPLETED. There remains, therefore, the third plot: 650 acres to the north of the Devizes Road. This tract, which includes the southward-facing road frontage immediately opposite the stones, is in obvious and immediate danger of building, and the price asked is £16,000. UNLESS IT IS SAVED THE WHOLE WORK OF THE COMMITTEE AND THE SUBSCRIBERS WILL HAVE BEEN IN VAIN) AND STONEHENGE WILL HAVE A SOLITUDE TO THE SOUTH AND A STREET TO THE NORTH. That the leaders of all political parties should unite in appealing for such a cause is not surprising. Salisbury Plain is the greatest of our archeological sites, and Stonehenge, a mysterious legacy from the dim beginnings of our civilization many centuries before the Romans came, is the heart of the Plain. Causes-and good causes- are appealed for every day, and it is evident that not everything worth “saving” can be “saved.” But we have not two Stonehenges, and our generation will be vilified by all posterity if we allow the surroundings of this monument, the frontispiece to English history, to be ruined beyond repair.